A beautiful hexagon Japanese Satsuma Majolica style earthenware vase, circa early 20th century, Meiji period, Japan. Vase is decorated with a beautiful tile-like exterior; a raised relief of crane birds and blue water/sky. Colors include: turquoise blue, white, black, grey and yellow. Vase measures: 2.50" x 2.75" x 6.25" H. A second vase in a similar vain available, for more information search 1stdibs ID#: LU1314210119763. 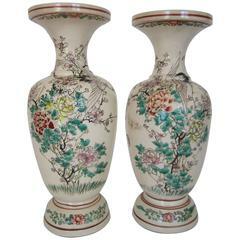 A beautiful 1880s decorated pair of Meiji period Satsuma vases. Uniquely hand painted and glazed finish depicting a family get together. The vases are stamped on the bottom. Japanese Satsuma vase: Ladies of the Court, Kannon and Gilded Dragon. Signed on the bottom.